In this instance I have used a Lozenge Argent in the centre chief point. 1. An unmarried woman may continue to bear her paternal arms on a lozenge, oval or similar vehicle of display (not being an escutcheon or a colourable imitation thereof) or on a banner. 3. Whether or not her husband is armigerous, a married woman may bear her paternal arms alone on a shield or banner differenced by a small escutcheon of a contrasting tincture in the canton, centre chief point or other suitable position depending on the design. 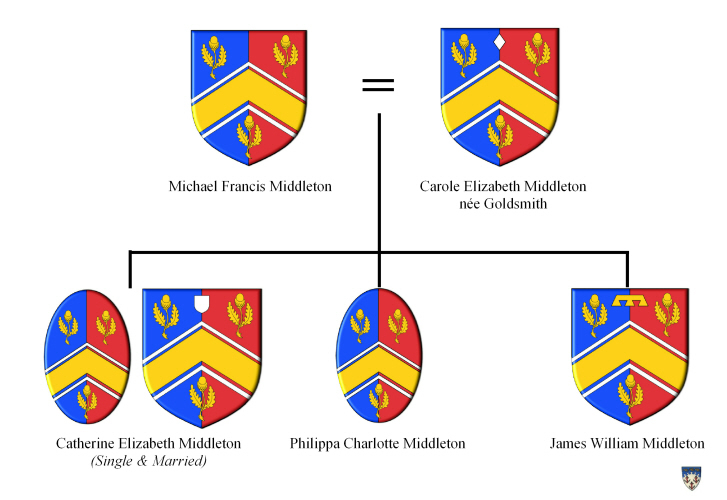 Finally, Mr Middleton’s son, James, displays his father’s Arms on a shield but with a label of three points to denote he is the eldest son. I understand that the use of white/argent labels are reserved for the Royal Family in English heraldry. I have, therefore, use a label Or.